Marbella has so many things to see and do, you could be kept busy even if you stayed for a very long time. The history of the region has created beautiful towns as well as stunning landscapes, and the crystal clear waters of the ocean are simply hypnotic. But if you're planning what to do and want to try something a bit different, why not visit one of the zoos or wildlife parks in the area? Below is a guide to some of the places which are worth a visit. Love them or hate them, you can't help but be entranced by their prehistoric power: crocodiles never fail to provoke a reaction in most people. Crocodile Park in Malaga is open all year round and features more than 200 crocodiles for visitors to observe. Crocodiles have survived for more than 200 million years, shrugging off evolution, outlasting the dinosaurs but keeping those same primeval instincts. The Park provides the opportunity to get as close as two metres to these silent killing machines, watching them without being seen. The Park is keen to educate the public about crocodiles so offers unique opportunities such as being able to be photographed holding a baby croc, free of charge. A tiny replica of the fully grown beast, there's something endearing yet still intimidating about these mini crocs but they're perfectly safe to hold. With tours and demonstrations every day, you can expect a visit to the Crocodile Park to last for two hours. One of the world's most feared wild creatures closely linked to a myriad of myths and legends, the wolf is an animal which is at risk of extinction. Having already died out in some parts of the world it previously inhabited, the wolf is a beast that's sorely misunderstood. Lobo Park offers an incredible opportunity to look a wolf directly in the eye, an experience which can't fail to leave you feeling emotionally charged. The environments allows the wolves to lead a semi-natural existence but as all were raised by humans and bottle-fed; they lack the instinctive shyness that would be seen in the wild. All the wolves have been hand-reared to eliminate their fear of humans, thereby ensuring their existence in the park is stress-free. They have not however been 'tamed' or domesticated, but simply had their fear removed to ensure a better quality of life. There are four sub-species of wolves at the Park, along with a small petting zoo for children to get up close and personal with less dangerous animals, such as goats. For an extra special experience, visit the park for one of their Howl Nights, allowing you to enjoy the Park away from the warm Marbella weather of the day. Taking place on a full moon, it provides the opportunity to see the wolves at night, when they are naturally far more active and will howl and call to each other, an eerie and spooky sight. 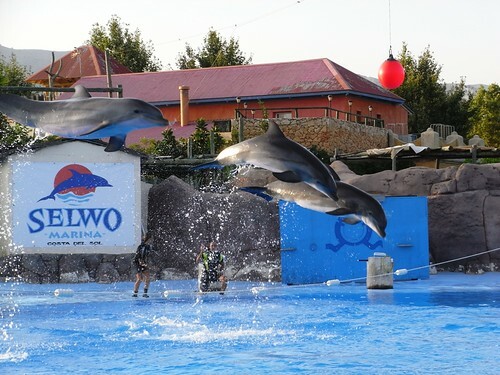 An animal park focusing primarily on the water, Selwo Marina Delfinarium has an extensive range of creatures and species which stretches from those seen on the surface to the fish which inhabit the depths of the ocean. There's large mammals such as bottle-nosed dolphin and the South American Sea Lion (as well as the Indian Flying Fox and the Squirrel Monkey) plus reptiles such as the Giant Tortoise, Tree Boa and Broad-Snouted Caiman. Poison Dart Frogs command attention with their bright colours while Red-Bellied Piranha grins toothily from the safety of the tanks. There are birds too with pelican, flamingo, penguins, cormorants and macaw all on display. During a visit to the park, you can wander round the animals, watching them interacting with each other at close quarters but there's also exhibitions and shows scheduled at various points throughout the day. Visitors wanting something extra special can pay for 'experience days' where they are given the chance to get in the water with the dolphins or the sea lions, a once in a lifetime opportunity to get close to these gentle and amazing creatures. A sanctuary for animals, Castellar Zoo is an initiative which originally sprung into life in 1998 and was opened to the public in 2002. An official animal rescue centre, Castellar takes animals that have been abused by the black market and ultimately seized by authorities. A very special place, offering a safe home to a myriad of creatures that have been mistreated and neglected, Castellar Zoo aims to provide the best possible conditions and care to animals that've been unloved and uncared for. The doors were opened to the public to help raise funds for Castellar to continue its work but also to increase awareness. The success of the Zoo has led to more facilities being added and extra installations being created. This Zoo is unlike any other you may have visited in the past; the animals can be fed by the visitors and direct interaction is positively encouraged. There's a young Bengal tiger, lemurs, monkeys, emus, pot-bellied pigs, a hyena, rabbits; the list is endless. There's currently more than 120 different species resident at the zoo with more than 500 animals resident. 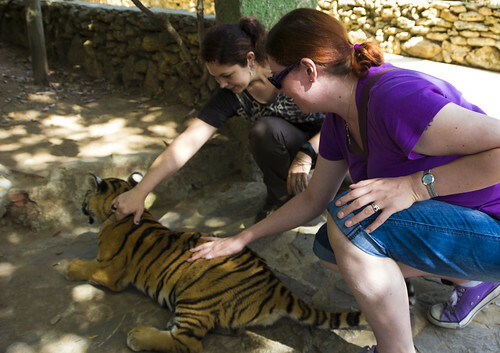 You'll be surprised at how much interaction with the animals is permitted, and with close supervision, children will be able to have an experience here like nowhere else in the world. Open from 10am to 8pm, the Zoo receives no grants or support from the government ad relies on donations and entrance receipts to stay funded. It's easy to reach, lying just outside Castellar de la Frontera, on the A7 from the Malaga region, an easy day trip from Marbella.